This really is a case where a simple exterior gives no indication of the interior to come. Ynyscynhaearn (pronounced Unnesscunnhairn), Grade II* and vested with the Friends in 2003, sits on the former island (Ynys) in Llyn Ystumllyn at the end of an ancient causeway. St Cynhaearn (a man of princely birth who embarked on a monastic life on the death of his father fighting the Saxons) is said to have first worshipped here in the seventh century (with the 1892 Gestiana recording burials from AD 730). The nave is 12th century and the north transept is 16th century, but in architectural terms it is the extraordinary interior which makes it special. St Cynhaearn’s feels like a complete late-Georgian estate church of 1832, although it did serve as the parish church for the broader area until Porthmadog provided itself with its own place of worship at the end of the 19th century. The two chief fittings are the Flight and Robson chamber organ, given in 1834, set in its west gallery (complete with curtained pew for mothers and their young children) and the full-blooded three-decker pulpit, with a position for the priest delivering the sermon and a desk for those delivering the readings. The north transept, which dates from 1622 in fabric, is full of tiered pews delicately painted with the names of the estate owners who were entitled to sit in each. The two excellent stained glass windows of 1899 and 1906 are both by Powell and Sons, one of them showing St Cynhaearn in monastic garb. You pass into the churchyard through a lychgate that seems, like that at Penmorfa, to be the work of Nature not Man. Here the parish poor sat on the sheltered stone benches for alms donated by the better off and arrived for their last journey, conveyed to the west entrance on the bier hung on pegs under the lychgate roof. The churchyard uniquely includes the grave of a black man known as ‘John Ystumllyn’ (or Jac Du / Jack Black) who was captured in Africa circa 1742 by a member of the Wynne family, whose Ystumllyn estate surrounded the church, and lived out his days in Georgian Wales. Read more about ‘John Ystumllyn’. The carved harp in relief on a chest tomb south of the path points to another local celebrity. This is David Owen, harpist and composer, generally known as Dafydd y Garreg Wen (David of White Rock), the name of his farm at Ynyscynhaearn. The air of that name was composed on his deathbed in 1749 (he was just twenty-nine) and performed in the church at his funeral. It was sung again in 1923 by Mostyn Thomas, the first words in Welsh to be broadcast on the BBC, and it is performed at the annual Remembrance Service at the Cenotaph in Whitehall. In the recent repair campaign we have re-limewashed the interior but this may need further work. Late in 2011 we took the plunge and removed the external render on the west elevation. This revealed high quality stonework underneath which looked as if it was meant to be seen. We could not run the church without the invaluable help of Suzanne Millard, and are extremely grateful to local people for all that they do. Keyholder nearby. Contact the office for details. 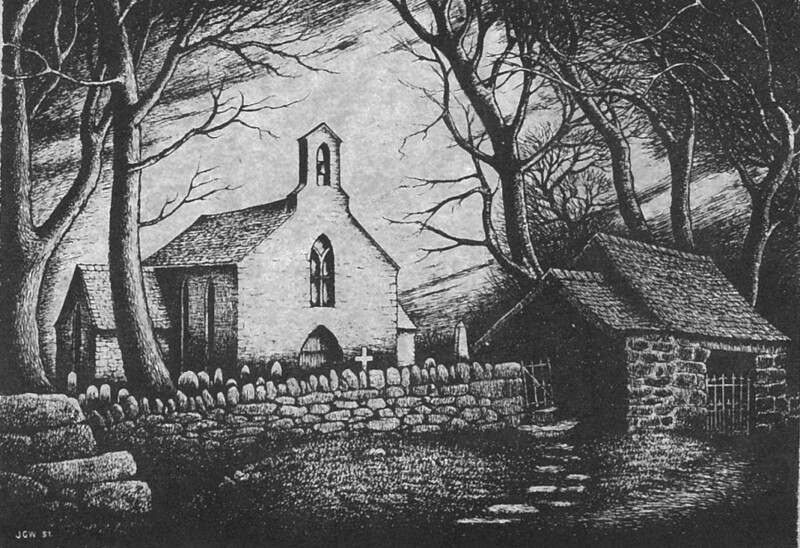 Penmorfa church is walkable from Ynyscynhaearn. Read more about Penmorfa.